Front: Lifted knuckles, front and rear crossmembers, upper strut spacers, steering stops, brake line brackets, differential drop brackets, bumpstop brackets, sway bar drop brackets, and lower skid plate. Rear: Lifted cast iron blocks, u-bolts, brake line brackets. Shocks: (2) rear Premium N2.0 series shocks. Unmatched ground clearance due to high clearance crossmember design. 100% precision laser cut materials used in latest computer aided design process. Provides highly sought level stance when complete. 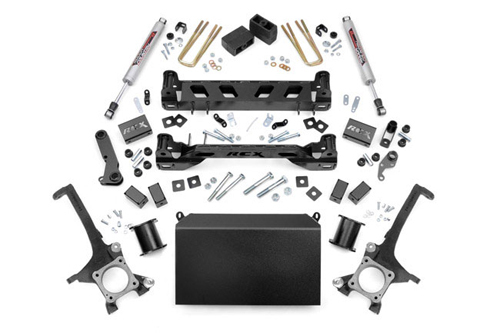 Requires no modification to the stock differential mounts, drivetrain or exhaust. Minor cutting & drilling is requires. Stock wheels can be used but can accomodate tires no wider than 11.5". In some cases minor trimming may be needed to clear 35" tires. Please view instructions for complete information on proper tire/wheel combinations. *Shown in picture Silver Tundra with 18" Chrome XD Monsters wheels. 295/70R 18 Nitto Terra Grapplers.